A long-long time ago all a photographer needed to successfully market their business was develop an excellent reputation that could be carried by word of mouth, they needed to have a studio in a prominent location and a big listing Yellow Pages. It all changed with the Internet and websites – the stylish splash page, web image galleries and even music became the norm. A website, the best ones done by professional webmasters, could be out there for years and become, for the photographer, something to ‘tick-off’ on their marketing plan. You could feel comfortable that when people searched, or ‘Googled’ you, up would pop your site. You could direct enquiries to view your work through their home – or perhaps more often, the work computer and those that did stumble upon your site could give you a call to follow through with an enquiry. The website became an extension of convention marketing, essentially to people who knew of you. It was not necessarily about finding new business. The emergence of social media tools like MySpace, Facebook, Twitter and Flickr has changed that comfortable marketing strategy. The general public was transformed or, perhaps even they themselves transformed, the norms of marketing. They now seek information about anything by using online search technologies to filter info sources or service providers and then make decisions about what they want to know or purchase. Most critical to this seek-find-and-buy online paradigm is what search engines give in their result lists. Crucially, in recent times, there has been the move by the big Google corporation to seek results from content that has currency. The static website is relegated to the back result pages – whereas web presences that are, by the currency of their content, about today, now will rate higher. Photographers who Google themselves or their industry area only to find they rate on the results back pages now suffer the anxiety of how to get to #1. In mid 2011 I encountered a sign that indicated a view of the static website’s future in the website of Toowoomba photographers Katie Finn and Matt Ebenezer. 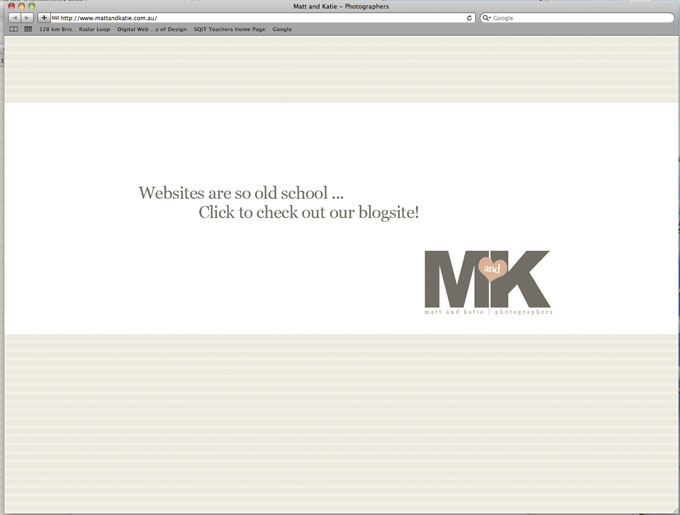 The splash page bore the message ‘websites are so old school … Check out our blogsite’. The blog was interactive and wedding photography albums were replete with comments and posts by the subjects pictured as well as by visitors to the blog – these were instant testimonials. What is more important is that this interactive component constitutes a constantly being ‘added to’ web presence and that is the stuff that Google likes. Mel Campbell @ Skillspath Social Media Marketing Conference - A great presenter! I’m in the former cohort. In January 2011, on an invitation from AIPP and Ballarat International Foto Biennale guru Jeff Moorfoot, I signed up to Linkedin. I dutifully populated my profile, linked with acquaintances, friends and people I’ve done business with and I integrated Linkedin/blogs/folio sites into my teaching practice. In February 2011 Victoria and I started this WordPress blog, our website was updated around the same time. We’ve added-in YouTube, Behance Creative Portfolios and Twitter to our suite of Internet presence strategies. Over 12 months the comparative analytics has overwhelmingly indicated the blog outdoes the website 20:1 and a search engine test places Linkedin, the blog and its many posts much higher than the static website. Our online presence has been viewed by thousands of people and our images, videos and posts clicked on all over the world. Has social media made a difference for us? In some ways it is hard to tell – our presence is not about selling anything, it is more about the expression of ideas, commentary about activities, events and experiences that do not get published elsewhere. And just by the way search terms pick up those unusual postings, images and videos someone out there is looking and connecting. Maybe the website is dead. Now, and what is ‘now’ is all that counts in our society so all that you need to do is jump-in and be active in social media – otherwise you will be left behind! PS I could go on for hours about this topic – there will be future posts.